The mosque attended by accused Baltimore bomb plotter Antonio Martinez is part of a network of mosques run by the radical group Jama'at al-Muslimeen that questions the existence of the Holocaust, supports the release of convicted terrorists and wants the United States to stop "interfering" in Muslim countries, Maryland corporate records show. Martinez, who was arrested Dec. 8 and charged with plotting to blow up an Army recruiting center in Catonsville, Md., attended the Al-Madina mosque in Baltimore, friends and associates told The Baltimore Sun. That mosque, Maryland records show, is owned by the All Farooq Foundation of Catonsville. The foundation's incorporation papers, which were filed with the state of Maryland on Feb. 3, 2009, say that all leaders of the foundation "must have at least one year of active membership in the Masjid Jamaat al-Muslimeen community." State records show that the Masjid Jama'at al-Muslimeen's address – 4624 York Rd. in Baltimore – is the same as the group Jama'at al-Muslimeen, which is run by Kaukab Siddique, an assistant professor of English at Lincoln University in Pennsylvania and a longtime opponent of Israel and U.S. policies in Muslim nations. Incorporation papers filed Oct. 6, 2003, by the Masjid Jama'at al-Muslimeen with the state of Maryland list Siddique as one of four mosque trustees. The mosque's stated purpose and rules for elections and trustees are virtually identical to those for members of the All Farooq Foundation and are in the same handwriting, records show. Jama'at al-Muslimeen (JAM) also calls itself the Islamic People's Movement International, according to its website. At a Nov. 6 conference in Greensboro, N.C., the group's officials reelected Siddique as JAM's leader, according to an account of the meeting in New Trend, an online magazine edited by Siddique. Question the accuracy of historical accounts of the Holocaust in which 6 million Jews were killed by the German Nazi government in World War II. "No one has a right to exclusive victim status. As for offensive viewpoints, comments and abuse on Jesus … in the Zionist media have gone beyond decency, without any attempt at scholarship," the resolution says. Remove U.S. troops from Muslim nations. "We demand immediate withdrawal of all U.S. and NATO troops from Iraq and Afghanistan. We urge an end to the occupation of Kashmir by India and of Chechnya by Russia. We call for an end to U.S.-Israeli interference in Somalia, Sudan and Nigeria," the resolution says. Demand that President Obama free "Muslim political prisoners." Those prisoners include Omar Abdel Rahman, the blind sheik imprisoned for life for a variety of terrorist plots; Aafia Siddiqui, a Pakistani woman and former U.S. resident imprisoned for life for plotting to kill American troops in Afghanistan; and Ali Al-Timimi, a former Islamic lecturer in Washington who's serving a life sentence for trying to recruit members to help the Taliban kill U.S. troops in Afghanistan. Maryland records show that JAM controls three mosques in the state, either directly or through the All Farooq Foundation. They are the Masjid Jama'at al-Muslimeen in Baltimore, the Al-Madina Mosque in Baltimore and the Masjid Al-Muneer in Curtis Bay, Md. The Al-Muneer mosque was incorporated in May. JAM's officials include Badi Ali, imam of the Islamic Center of the Triad in Greensboro, N.C.; Abdulalim Shabazz, a mathematics professor at Grambling State University in Louisiana and Abu Talib, a JAM activist in Brooklyn, N.Y. The group's website also lists affiliated mosques in Knoxville and Oak Ridge, Tenn.
Ali has history with two American-based support groups for Palestinian terrorist organizations. He is listed among the members in a 1991 document attached to an organizational chart for the Palestine Committee, a group created by the Muslim Brotherhood in the United States to support Hamas. A year later, Ali identified himself as the North Carolina chairman of the Islamic Committee for Palestine (ICP) in a letter to the New York Times. The ICP was the "active arm of the Islamic Jihad Movement in Palestine." Siddique, JAM's longtime leader, has an extensive history of calling for the destruction of Israel. On Sept. 3, he was among a series of activists who protested U.S. policies at an Al Quds (Jerusalem) Day rally in Washington's Dupont Circle. There he said that Muslims "must put their hands on the Quran and say that they do not recognize Israel as a legitimate entity." Other media organizations followed the IPT News report on that event. That reporting led Pennsylvania legislators to write Lincoln University President Ivory Nelson to investigate Siddique's "anti-Semitic" activities and determine if his teachings included anything related to the Holocaust. "While he has a right to free speech on his own time, he does not have the right to teach this trash to students in a classroom," said state Sen. Daylin Leach, a Democrat, of Siddique. Lincoln University is a historically black state-run university in eastern Pennsylvania. Siddique is listed as a member of the school's English faculty. The U.S. power structure wants to set up a 'mosque' near Ground Zero," he said during an Oct. 8 speech at an unnamed mosque in Baltimore, the Oct. 11 New Trend reported. "Rabbis are supporting it. Israel has destroyed more than 130 mosques. Why are the Jews supporting a mosque in New York?" "We pray for the victory of Islam in Pakistan, Afghanistan, Iraq, Kashmir, Chechnya, Somalia, Sudan and Nigeria where the Muslims are struggling for victory," the Dec. 6 New Trend reported Siddique saying in a speech at an unnamed mosque in Baltimore. "Above all we pray, O Allah, for your help to defeat the Yahood [Jews] and remove them from Palestine." Martinez, the accused bomb plotter also known as Muhammad Hussein, echoed many of these beliefs, court documents show. According to confidential witnesses cited in the federal complaint, Martinez spoke often his desire to commit jihad, not just against U.S. forces in Afghanistan and Pakistan but in the United States as well. "I wanna actually be Shaheed [martyr]) .... Like actually die for the cause of Allah," Martinez told one witness, the criminal complaint shows. 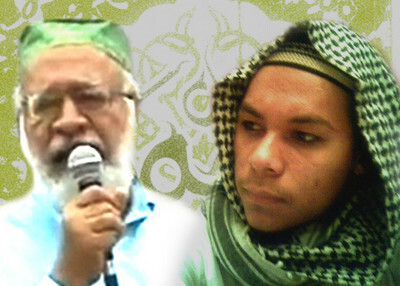 Martinez's desire for jihad is similar to those called for on the JAM website, including a Feb. 20, 2009, speech by Ali in which he calls for jihad that "is a victory against hypocrites who secretly collaborate with the enemy." In December 2008, Ali said in a speech that Hamas was "independent Islamic body in the captive Middle East" that was targeted for destruction by Israel and other Arab nations.